The Albemarle Ruritan Club’s Installation of Officers ceremony was featured in the Spring 2015 Ruritan National Magazine! Congrats to the Albemarle Ruritan Club for sending the article in to the magazine for publication! All local Ruritan Clubs are encouraged to send press releases, with photographs, of all their events, for consideration of publication to the National Magazine and their local newspapers! The local Ruritan Clubs in the Rapidan District are encouraged to also send press releases to the Rapidan District’s Publicity Chairperson, for inclusion on the Rapidan District’s website! Contact information for all Rapidan District Officers can be found on the Cabinet District Directory page. Congratulations to the Belmont (VA) Ruritan Club for being featured in the Ruritan National Magazine’s Volume 79, Winter 2014 edition. The story is about the Belmont Club presenting scholarships to local students. 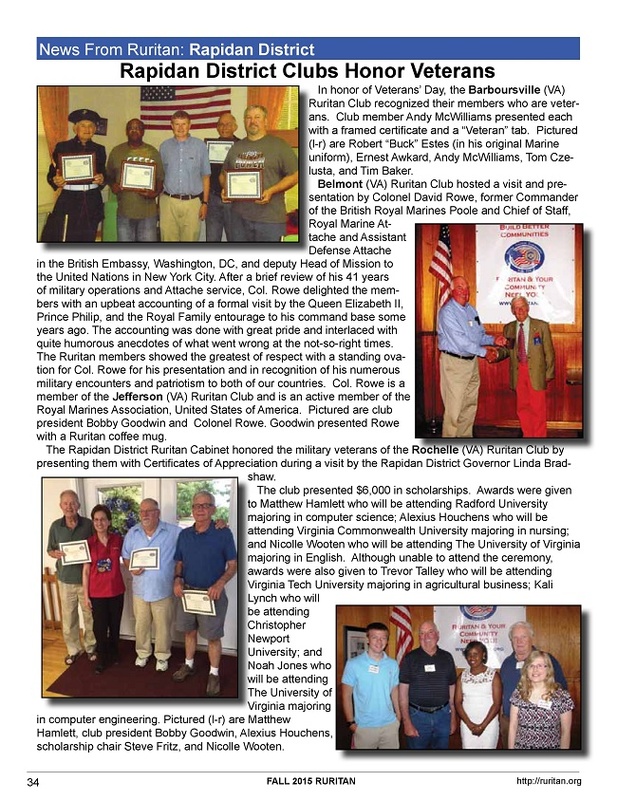 The Salem Ruritan Club was featured in the Fall 2014 Issue of the Ruritan National Magazine, on page 17. The article is about the three $1500 scholarship awards presented to local students. The article also covers the Salem Ruritan Club’s participation in the Culpeper County High School’s Senior Picnic. Congrats to the Salem Ruritan Club for getting their article in the Ruritan National Magazine!